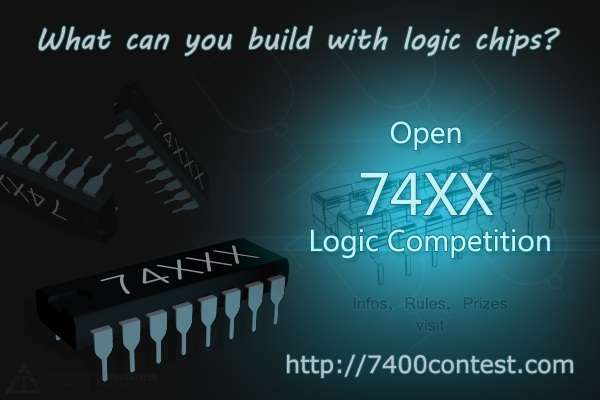 Thank you participating in the Open 7400 Competition. All the entries were amazing, check out the full list here. Four judges, Dave Jones from EEV Blog, Jayson Tautic CEO of TAUTIC ELECTRONICS LLC, Marc Alexander from Freetronics, and Dino Segovis from Hack A Week, and Ian from Dangerous Prototypes each made a top ten list. The projects with the most votes were awarded prizes. Winners will receive prize information by email in the next 48 hours. We want everyone to get a prize they can use and enjoy, so you can pick your own prizes through the free PCB store. First place winners will pick first, followed by second, then third. Remaining prizes will go to anyone who entered the contest. With unanimous consent of all judges, and also the reader’s choice winner, 7400 Capacitive Touch Array (Capacitive touch sensing the hard way) wins the grand prize of $100 and first pick of the prizes. Also a top ten of all judges, the 7400-based Capacitance Meter wins first place and next pick from the prizes. Nine entries took second place with votes from 2 judges. These winners get next pick from the prizes. 22 entries placed third with the vote of at least 1 judge. They get to pick a prize too. Thanks again for entering, we hope to see you again next year! Thanks to the sponsors, our judges, Dave Jones, Jayson Tautic, Marc Alexander, and Dino Segovis, Sven for the contest artwork, and the creative mind behind the 7400 Contest SQKYbeaver.We’ll send details to the winners by email. To ensure fairness the store will open to all 2nd place and 3rd place winners at the same time, and you will get some advance notice. This entry was posted on Wednesday, November 2nd, 2011 at 6:49 am	and is filed under 7400 contest. You can follow any responses to this entry through the RSS 2.0 feed. You can skip to the end and leave a response. Pinging is currently not allowed. So, result published 6 hours after estimated time. Congratulations, btw, your project was liked by judges and got several reader’s choice shouts. But unfortunately “Capacitive Sensing, the Hard Way” isn’t in the list. This one got most reader’s votes in the “Entries and reader’s choice” post. It won the grand prize and reader’s choice. I added “the hard way” in subtext so it is more clear though. Woo hoo! A big thanks to Ian and everyone else that helped make this happen! Thanks all of the contestants, sponsors and jury for the contest! It was very very exciting to participate. Yeah funny, but congrats, you’re 2nd in the contest. Fun to have participated ! My TV Pattern Gen was probably the only entry which used the astable, monostable and opamp functions of the CMOS series. I thought it was worth an Honorable mention. Thank you to the judges for placing me in the 2nd Place category with my Etch-A-Sketch toy. There were many, many worthy adversaries, making it a fun and challenging contest. I admire all who entered for their energy and creativity, especially the 1st place winners! Now, that being said- how does this prize thing work? I’m not sure what to do. Thanks Dangerous Prototypes & Sponsors and thanks to all the Judges! Thank you for the Grand Prize. Good to see many creative minds at work. Congratulations for everyone involved in the project. It was a great way of generating a lot of projects that didn’t use micros. Nowadays almost don’t this of using anything but a micro to do something, but when I was starting electronics I was eager for projects using discrete ICs. This list of projects would encourage from beginners to experienced to get their hands dirty. Thank you for holding this contest! I started a tad late (October 7), but I got something in and learnt a lot getting it in (mostly that prototyping on breadboards is far from ideal… and that my 3 year old jumper cables don’t make good connections any more). That said, congrats to everyone and I really enjoyed seeing everyones projects and documentation. I would also like to thank everybody involved. Thank you Ian and Dangerous Prototypes for organizing this event. Thank you also to all of the sponsors who are giving back to the community–not only with the prizes that they offer, but with their part in motivating folks to make these projects and spread the ideas and inspiration contained in them. Of course, thank you to the participants too, without whom this wouldn’t have really been much. I had a blast with this whole thing, and appreciated the excuse to spend some time to do something that I enjoy. Thanks everyone!!! Computer! What’s the current stardate? 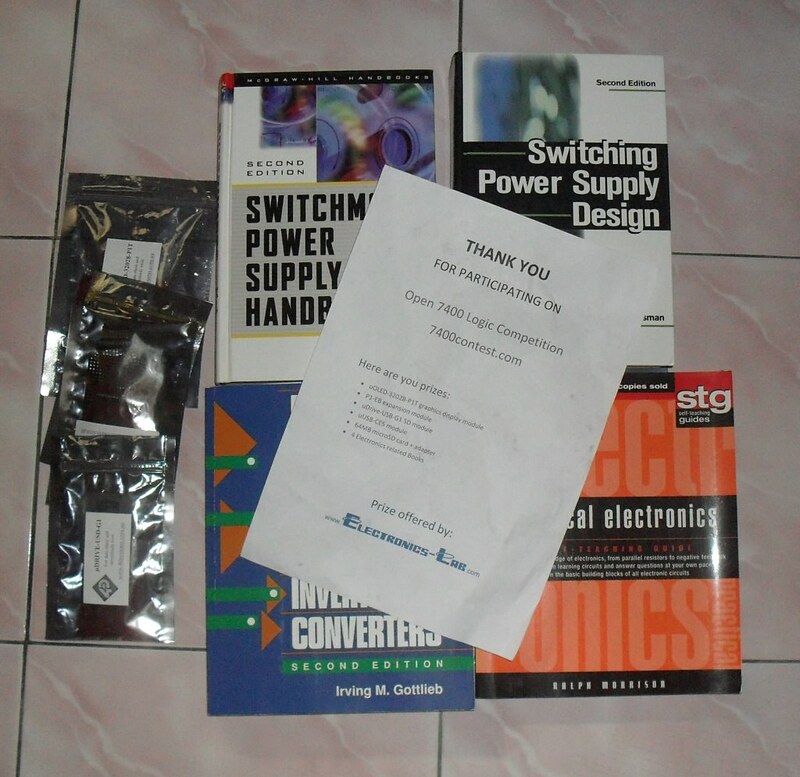 the prizes has come, thanks…. Congrats. Share a real picture too. Well, Because of timezone differences, the store opened at my local time 3am, and in morning almost all prizes were out. Then I used the code to order a free PCB. Maybe I’ll get it, if it is not lost in the postal process like my previous 2 free PCBs were lost. I wonder what do postal guys do by stealing the bare PCBs. Are they hackers too? I want to comment on the forums but there seems to be impaired (I can’t login). I was surprised after seeing the photos how the gift is sent (only with plain paper envelope). I think it would be better if shipped with cardboard boxes. You have to register in the forum and then you can reply there. Hi Bayu – can you please contact me through the contact form, maybe we can get the forum problem worked out. When the competition will start again?